WASHINGTON — The race to the presidential nomination begins Monday with the Iowa caucuses and culminates in July when each party’s standard-bearer will stand on the podium of the national political convention, having been selected by a majority of the delegates there. Each political party in each state has its own rules for selecting delegates to the national conventions, which will be held July 18-21 for the Republicans in Cleveland and July 25-28 for the Democrats in Philadelphia. Each state receives a certain number of delegates based on population and other factors, such as the number of elected officials of that political party. Some elected and party officials automatically get to be delegates. Other delegates are elected, depending on how much support their candidate garners in primaries or caucuses. 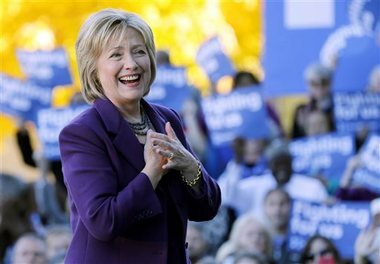 Which N.J. Democratic super-delegates back Hillary? One-third of New Jersey’s super-delegates to the Democratic National Convention next July have already endorsed former U.S. Secretary of State Hillary Clinton for president. Here’s how each party will decide who gets to sit on the convention floor. Republicans will send 2,472 delegates to their national convention. To win the nomination, a candidate must get the support of 1,236 delegates. Alternates, who get to vote in the absence of a delegate, also are selected. New Jersey will send 51 delegates to Cleveland. Each state gets 10 at-large delegates, with additional statewide delegates awarded based on how well Republicans have done in state elections. Thanks to the election of Gov. Chris Christie, for example. New Jersey received two additional at-large delegates. Those 12 delegates are more than the 10 at-large seats awarded to all-Democratic California. The state party chair and the national committeeman and committeewoman also are delegates. States receive another three delegates per congressional district, who are selected in each congressional district. For New Jersey, that’s 36 delegates. Through March 14, including Super Tuesday on March 1, delegates are awarded on a proportional basis. Some states require candidates to meet a threshold of support before winning any delegates. On March 15, for example, the winner of Florida’s primary will win all of that state’s delegates, as will the first-place finisher in the Ohio primary. New Jersey, which votes June 7, also is a winner-take-all primary. Democrats will send 4,763 delegates to their convention, with 2,382 needed for nomination. Those numbers could change slightly before Philadelphia. New Jersey will send 142 delegates. Like the Republicans, most of the delegates are allocated by population. There are no winner-take-all states but candidates must receive at least 15 percent of the vote to be awarded any delegates. Unlike the GOP, the Democrats have a category of delegates who officially are not pledged to any candidate but automatically go to the convention because of the position they hold. These so-called super-delegates include members of the Democratic National Committee, U.S. senators and representatives, governors, past U.S. presidents and vice presidents and past congressional leaders. For New Jersey, the list includes U.S. Sens. Cory Booker and Robert Menendez and all six House Democrats from the state, plus six Democratic National Committee members for a total of 16. While officially unpledged, many of them already have endorsed a candidate, such as Booker, who has campaigned for U.S. Secretary of State Hillary Clinton for the Democratic presidential nomination. The Democrats select delegates both by congressional districts and statewide; the at-large delegates are picked last and are used to ensure equal numbers of men and women are at the convention and to make sure the party meeds its goals for minority representation. In the delegate selection process, there is a carve-out for mayors of large cities, legislative leaders, statewide officials and other elected Democrats. The state party has 15 slots reserved for them.